The majority of the legal voters of congressional township 133, range 36, presented a petition to the county commissioners on January 2, 1877, asking for the creation of a civil township embracing the said territory to be known by the name of Oak Valley. This petition was dated November 15,1876, and was presented to the county commissioners at their January term, at which time they ordered a laying off and naming of Oak Valley township. The names of the petitioners follow: William M. Noyler, John W. Noyler, Marion S. Dockstoder, George Broughton, C. A. Smith, Thomas R. Williams, H. C. Williams, James Williams, G. J. Ausbourne, John Biggs, C. E. Thomas, William Thomas, H. P. James, A. C. Packard, S. M. Packard, A. M. J. O'Keefe, N. H. Packard, John Colson, Andrew Carlson, Charles G. Vedean, Andrew Hansen, W. M. Brattin, T. N. Brattin, J. M. Doudna, I. Hocking and David I. Johnson. The first election was held at the home of John Colston, January 22, 1877. Oak Valley township lies in the eastern tier of sections and is one of the three in this county bordering on Todd county. It is bounded on the north by Compton, on the west by Inman and on the south by Woodside. This township is outside of the lake district, although there are two small bodies of water in the western side. The natural drainage of this township is to the north and two of the tributaries of Leaf river rise in Oak Valley. These are only small creeks, flowing due north on the eastern and western half of the township. The eastern branch bears the name of Oak creek, while the western bears the name of Bluff creek. Farming and dairying is the chief vocation in this township. The farms are well improved and the land is fertile, due partly to the advanced methods of farming. There is no railroad and no towns in this section, although there were two postoffices for a number of years. These bore the names of Lyman and Ramsdell, but it has been impossible for the writer to determine their exact location. They have long since ceased to exist and the people in this section are accommodated with rural routes. Deer Creek is the nearest trading center for the inhabitants of this township. The Oak Valley Cooperative Creamery Company is located in section 8 and has a good patronage from the dairies in this township. There are three churches located in Oak Valley, namely, one in section 1, one in section 8 and another in section 17. There is a cemetery located in section 8 and also one located in 26. The present township officers are as follow: Supervisors, F. G. Trollier, A. W. Chapman and N. J. Finn; clerk, William Beck; treasurer, G. Menge; assessor, J. H. Walbridge; justices, Homer Paine and E. V. Bush; constable, J. W. Wallingford. 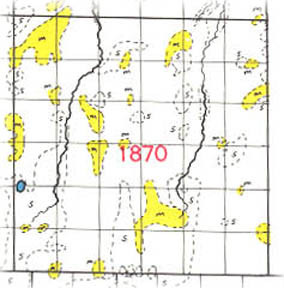 Places of birth for Oak Valley Township in the 1905 state census.